Downward Dog Pose helps energize us and instill calmness, as well as stretches the back, shoulders, side body, and legs. Begin in table pose, and tuck your toes. Press your hands down, and spread your fingers wide. Straighten your legs and lift your hips to the sky. Stretch your heart back towards your legs. 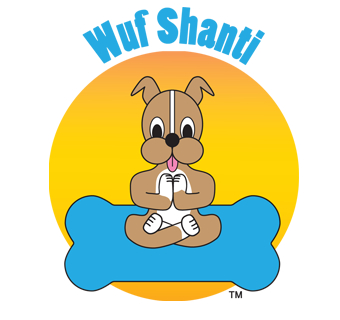 Pretend to be a doggie, bark like Wuf Shanti, and think happy thoughts.